The Cape Fear River has a burgeoning population of spotted bass for adventurous anglers. The author shows the kind of spotted bass that are starting to take over a long stretch of the Cape Fear River downstream from Jordan Lake. The Cape Fear is one of the longest and most diverse rivers in North Carolina. Beginning at the tailrace below B. Everett Jordan Dam, it flows 202 miles before reaching the ocean near the town of Southport. Along its rout, it has been known as a great fishery for catfish, striped bass and redfish. More recently, it’s become known for another species — the spotted bass. Most anglers associate the term spotted bass with other regions — and they aren’t wrong. The Alabama spotted bass is prevalent across the south; however, it is that fish’s cousin, the “northern spotted bass,” that has taken hold in the Cape Fear. Also known as the Kentucky spotted bass or simply a “spot” Micropterus punctulatus is the spotted bass species prevalent in the river, as well as in Lake Norman and other parts of the Catawba River system. Spotted bass were first introduced to the Cape Fear River in 1977 in some of its tributaries around Lillington. Naturally a riverine species, the spotted bass has quickly acclimated to the rock ledges, riffles and pools of the Cape Fear. This habitat, combined with ample forage of shad, bream, crayfish, insects and other baitfish, has allowed the spots to thrive. In fact, it has become one of the best rivers in the state to catch a citation-sized spot. By 2008, spotted bass had become more populous in the Cape Fear than the native largemouth bass. Today, spots are by far the most-dominant species in the river, making it uncommon to land big largemouths. This has been a common trend for spotted bass across the southeastern United States and is often considered a negative impact on the existing fishery. However, spots do continue to co-exist with largemouths in the Cape Fear as biologists had hoped, and both species can be caught. The spotted bass is often mistaken for the largemouth bass. However, a few features help set it apart. First are the spots on their side for which they are named — typically dark in color just below the dark lateral line. Some Cape Fear River spots may not exhibit this feature year-round, particularly during late spring and early summer. Second is the presence of a tooth patch on the tongue. Unlike other bass species, spots have a rough, dark patch of teeth on their tongue. A third feature, although less telling for identification purposes, is the tail. Similar to smallmouth bass, spotted bass have tails that are very large compared to their body size. These tails allow spots to propel themselves toward baitfish and put a serious bend in any fisherman’s rod. A 10-inch spotted bass often fights as hard a 2-pound largemouth and can be caught on light tackle. The final feature that helps identify the spot is its jaw. The jaw of spotted bass does not extend beyond the eyes as it does in largemouth bass. Northern spotted bass do not grow as large as their southern cousins, with a 2-pound or 15-inch fish considered a beauty. However, fish of this size are fairly common in multiple reaches along the Cape Fear. And the best thing about these bass is their year-round nasty attitude and aggressive demeanor. During the winter, spots can be caught in slow-moving pools, often near wood cover. A twater temperature reading can be extremely beneficial, as water that’s a degree or two warmer will often hold larger concentrations of spotted bass. In the winter, it is best to downsize baits and fish slowly. Small blade baits such as the Deep Creek Turner Burner work extremely well. Other good cold-weather baits include 3- or 4-inch stick worms and small crankbaits. As spring arrives, it often marks some of the best fishing of the year. Big spots begin to feast during the prespawn period as the river warms. Fish begin to move from slower pools to riffles and rock ledges. It is in and around these rock ledges that spotted bass spawn — typically in April and May. One of the best techniques during the spring is to set up at the bottom edge of pools formed by rock ledges with adjacent fast water. Cast minnow-imitating baits through the pool, making sure to work fast water, current breaks, and eddies thoroughly. Because of the aggressive nature of spotted bass, you can use typical bass lures such as buzzbaits, spinnerbaits, swimbaits, crankbaits and topwater plugs. In fact, you may also be rewarded with a big largemouth. As spring ends and summer arrives, fishing remains good, and big fish can still be caught. In fact, the postspawn lull is often not discernable. As the water warms and water level drops, the majority of spotted bass migrate toward the fastest water in the river. Pools formed by these fast chutes have high levels of oxygen, which in turn attracts baitfish and crayfish. However, big spotted bass tend to be more solitary and seek more isolated cover. Look for areas with slight current and submerged boulders adjacent to deep water. Areas with shade and bank cover should also not be overlooked. It is also in early summer that spotted bass begin to school. Anglers can often land multiple fish from one pool, pocket or riffle. If lucky, 10 or more spots may be landed from one location. The lures that worked during the spring will continue to produce, including topwater baits, which can be productive all day long. Toward late summer and into fall, algae growth dominates much of the river. However, in mid-October, much of the weed growth begins to die off and makes the river more fishable. The cooler temperatures again disperse the bass, and many different types of river cover can be productive. Big spots feed throughout the day during the fall, but the late afternoon and evening bite tends to produce the biggest fish. Again working walk-the-dog topwater baits and waking swimbaits can produce good fish. On most occasions, recommended gear includes medium to medium-heavy spinning set-ups spooled with 6- to 10-pound test line. Baitcasting gear can also be used and can be helpful for fishing with bigger baits and when you hook a big largemouth or other river species such as striped bass, gar, catfish or bowfin. The range of the spotted bass in the Cape Fear goes from the Jordan Lake tailrace downriver to the US 701 bridge near Elizabethtown. However, we can expect the spot’s range to continue to expand. In fact, spotted bass have already been reported in Jordan Lake, the Deep River and Shearon Harris Reservoir. Within the upper reaches of the Cape Fear, fishing is particularly good below Buckhorn Dam through Raven Rock State Park and reaching to city of Fayetteville. Along this stretch, there are a number of access opportunities for anglers. Bank fishermen can find easy access near Buckhorn Dam, Raven Rock State Park and Lillington. Wade fishing is also a plausible option in some areas during the summer. Additionally, many stretches can be accessed by jonboat with a small outboard or trolling motor on the back. Some, such as the stretch below the Jordan Lake tailrace, can be accessed by nearly any type of boat, but spots are less common in the 9-mile stretch below the dam. The best option for fishing the Cape Fear is a kayak, canoe or other personal watercraft. These boats allow for an easy launch nearly anywhere along the river and are more than capable of handling the rapids, shallow rocky areas, and long, flat stretches. Portions of the river do contain potentially dangerous, technical rapids and should be approached with caution. In particular, the area from Lillington down river toward Fayetteville contains rapids up to Class II and, under certain conditions, Class III. It is important to keep an eye on the USGS gauging stations along the river. Ideal flows for fishing vary between 800 and 2,000 cubic feet per second (CFS). When the flow drops below 1,000 CFS, access for larger boats can become difficult downstream from Buckhorn Dam. Flows below 450 CFS remain fishable but make boating difficult in many reaches. Flows above 3,500 CFS make fishing difficult, but allow for easier access via boat. 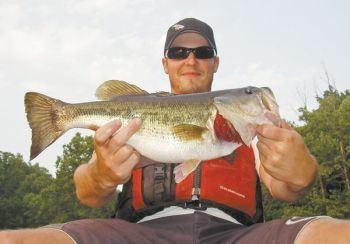 The rapids and rocks in the upper to middle stretches of the river are also the best bet for trophy size spotted bass. Spots over 13 inches can be caught year-round near Lillington, and many spots over two pounds will eat aggressively during the spawn. Fish to 17 inches have also been reported in that area, and even during the summer, citation-size bass can be landed. With the available forage in that region, spots should continue to grow in size and may one day challenge the state record from Lake Norman — a giant weighing over six pounds. *With a little planning, scouting, and luck you may land yourself a trophy Cape Fear River spotted bass. Order your subscription to Carolina Sportsman Magazine and Save! Carolina Sportsman is the complete hunting and fishing magazine for Carolina. Carolina Sportsman is the information guide for Carolina's most active hunters and fishermen. Piedmont Bass Classics $10K Team Bass Trail Final Qualifier #7..Falls Lake.. This Sat. June 3rd Reminder..Last One !!! CarolinaSportsman.com is a supplement to Carolina Sportsman Magazine. Copyright © 1999 - 2017 Carolina Sportsman, Inc. All rights reserved.